Flowering dogwood (Cornus florida) bloom. The flowering dogwood (Cornus florida) is the species most people think of when the word dogwood is mentioned. Although it is considered one of the favorite trees in the south, there are two other species, kousa dogwood (Cornus kousa) and Cornelian cherry dogwood (Cornus mas), which will grow in all areas of South Carolina except along the coast from Charleston to Savannah, Ga. The flowering dogwood is adapted to all areas of the state and is native to the Eastern United States. Mature Height/Spread: The height and spread varies depending on the species and its location in the landscape. The height ranges from 15 to 20 feet tall (flowering dogwood in the sun) to 40 feet tall (flowering dogwood in the shade). The spread may be even greater than the height. Growth Rate: Dogwoods grow at a slow to moderate rate (about 20 feet in 25 years). Ornamental Features: Each species brings its own value to the landscape. The “flowers” of the flowering dogwood and kousa dogwood are not actually flowers, but bracts, which are modified leaves that look like petals. The true flowers are clustered in the center of these bracts. The “flowers” may be white, pink or yellow. They may bloom in late winter/early spring before leaves appear (flowering and Cornelian cherry dogwoods), or later in spring after leaves emerge (kousa dogwood). Fruit may be scarlet red (flowering and Cornelian cherry dogwoods) or pinkish red (kousa dogwood). Flowering dogwood (Cornus florida) in bloom in April. One of the most appealing features of many dogwoods is the graceful beauty of their tiered, horizontal branching. This is especially true of flowering and kousa dogwoods sited in shade. Cornelian cherry tends to be multi-stemmed and is formed more like a shrub than a tree. Problems: The flowering dogwood is susceptible to many diseases and insect pests. Some kousa dogwoods are more resistant to these pests than flowering dogwood. Cornelian cherry dogwood is generally pest-free. For more information on disease and insect problems on dogwoods, refer to HGIC 2003, Dogwood Diseases & Insect Pests. Landscape Use: Each of these species is recommended for use in screens, as a border accent, near a deck or patio, or as a specimen. While other dogwoods do well in full sun or partial shade, the flowering dogwood prefers partial shade, especially shade in the hot afternoon. Dogwoods prefer moist, well-drained, acidic (5.5 to 6.0 pH) soil that is high in organic matter. Add organic matter, such as compost or ground composted pine bark, to the planting bed and till into the soil before planting. Mulch a large area around the tree to help retain moisture and prevent mechanical damage from lawn mowers and trimmers. 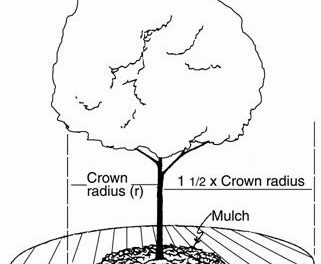 A mature tree should have a 2- to 3-inch deep ring of mulch at least 8 to 10 feet in diameter around the tree. However, do not place the mulch directly against the trunk. Pine straw, compost, or ground barks all make excellent mulches to keep shallow roots cool. Fall is the best time to plant. Containerized plants will become established more quickly than field-grown (B&B) trees. Fertilize dogwoods lightly in the spring once frost has passed with a well-balanced, extended-release, acid-forming, azalea fertilizer. Fertilize again 6 weeks later to encourage extra flowers or faster growth of young trees. 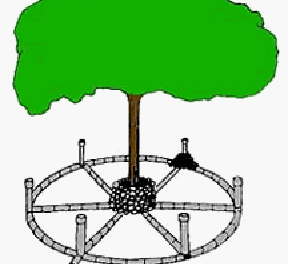 Avoid fertilizing trees stressed by drought during the summer months. Vigoro Azalea, Camellia & Rhododendron Food (10-8-8). Dogwoods do not tolerate extremely wet or dry soils, and should be watered deeply (1 to 2 inches per week) during dry periods, especially if located in the sun. Adequate soil moisture is important during the summer months, as C. florida is a shallow-rooted tree. These may be some of the first trees to succumb to drought injury if not mulched and watered. If irrigation water is applied by sprinklers, it should always be done in the morning to reduce risk of foliar disease. Good air circulation is necessary to hasten drying of leaves after rainfall and to lower the risk of disease. To reduce the chances of disease, purchase trees from a reputable nursery. Do not dig up plants from the wild as these plants may often carry diseases, such as powdery mildew and spot anthracnose. Nursery-grown trees will also recover from planting more quickly than those dug up in the woods. Bright red, flowering dogwood (Cornus florida) fruit are eaten by migrating birds in the late fall. Mature Height/Spread: The flowering dogwood will grow 40 feet tall when grown as an understory tree in a woodland setting. In the sun, the same tree may only grow 15 to 20 feet tall and wide. Spread can be greater than height at maturity. It can be grown as a single or multi-trunk tree. Growth Rate: A slow to moderate grower, this tree can grow 15 feet in 18 years; it may grow more quickly in shade. For USDA zones 5 to 9. Ornamental Features: The showy white, pink or red “flowers” bloom in spring (April and May) before the leaves emerge. Cultivars with pink or red blooms arise from the natural occurring variety of flowering dogwood, Cornus florida var. rubra. Dogwood trees grown from seed will vary in the age at which they begin flowering, but almost all dogwoods sold are asexually propagated and flower at an early age. The fruit of the flowering dogwood turn bright red in September and October. They grow in clusters, and if not discovered by birds and other wildlife, can persist on the tree until December. Flowering dogwood (Cornus florida) with dark red fall color. The fall leaf color is red to reddish-purple, although those sited in full shade may have poor fall color. Flowering dogwoods sited in shade are tall and thin, with graceful, open, horizontal branching. Those growing in the sun tend to be shorter, denser and more compact. They also produce more flowers than those in the shade. Problems: The flowering dogwood is susceptible to several diseases and pests. The common dogwood borer (Synanthedon scitula) will attack newly planted specimens (especially during the first two years), trees in poor health, trees under drought stress, or those with trunks damaged by lawn mowers or weed trimmers. To reduce the chance of trunk damage, and thus insect and disease incidence, provide mulch beneath the canopy of dogwoods. Other infrequently occurring insect pests include midges (which cause club-shaped galls or swellings on twigs), granulate ambrosia beetle, scale insects, and leaf miner. Trees under drought stress are more prone to attack by insect pests. Spot anthracnose (Elsinoe corni) causes necrotic (brown) spotting on both foliage and flower bracts in spring. This disease is worse when the spring weather is cool and wet. Powdery mildew (Erysiphe pulchra and Phyllactinia guttata) will distort new foliage and coat the leaves with white fungal growth that often desiccates the leaves and causes leaf drop on flowering dogwood. Cultivars are available with spot anthracnose and powdery mildew resistance. For more information and control measures, see HGIC 2003, Dogwood Diseases & Insect Pests. Dogwood canker (Discula destructiva) is a fungal disease that causes leaf and twig blights and trunk cankers. This disease can kill flowering dogwood, but fortunately, it seems to occur at higher elevations than in South Carolina. Conditions for severe disease outbreaks are in cool, wet weather, in shady locations, and near lakes or streams, which contribute to higher humidity. Dogwoods under drought stress are also more disease susceptible. Resistant cultivars may be planted, which include C. kousa cultivars and some of the C. kousa x C. florida hybrids. One cultivar of C. florida (‘Appalachian Spring’) was found highly resistant. Dogwoods are prone to root rot (Phytophthora species) if planted in poorly drained sites or if frequent flooding occurs. Landscape Use: The flowering dogwood can be used as a specimen, near a deck or patio, as a border accent or in screens. It is a good small shade tree, and works well naturalized in open woodland areas, especially at the edges of woods, where it will receive some sun. The ideal soil for flowering dogwood is moist, fertile, sandy or loamy and slightly acidic. It must be well-drained. Although it prefers partial shade, especially in the afternoon, it will tolerate full sun. Place in a site where there is good air circulation. Provide deep irrigation during dry periods, especially for those located in the sun. This is essential during the first few years of establishment. When planting, locate in an existing landscape bed, or provide mulch to prevent mechanical damage and help soil retain moisture. Although routinely grown with multiple trunks, it can be trained to a short, single trunk. Prune drooping branches if located near a patio or walkway. Keep pruning to a minimum and prune after flowering in the early summer. Kousa dogwood (Cornus kousa) in bloom in May after the leaves have matured. Mature Height/Spread: The kousa dogwood will grow 15 to 30 feet tall and wide. It is native to Japan, Korea and China. The naturally occurring variety, C. kousa var. chinensis, is native to China, and varies slightly from the species with slightly larger floral bracts, fruit, and leaves. Younger kousa dogwoods grow upright, but with age, they spread more broadly with horizontal branching. Growth Rate: A slow to moderate grower, it will grow about 10 feet in 15 years. For USDA zones 5 to 8. Red colored kousa dogwood (Cornus kousa) fruit in autumn. after the flowering dogwood. Most are creamy white; some will turn pinkish with age. The showy fruit are pinkish-red to red, and appear in September and October. They resemble raspberries and are edible, although somewhat mealy. Fruit could cause some litter problems. Fall leaf color is varies from purple to red to yellow. The branches of this species grow upright in a young tree, and droop as the tree ages. The strong horizontal branching in older trees is an especially attractive feature. The kousa dogwood cultivars are all deciduous, except for the naturally occurring variety, C. kousa var. angustata, which has remained evergreen in the Upstate to 9 °F. Evergreen kousa dogwood (Cornus kousa var. angustata) flowering in early June in Upstate South Carolina. Problems: Some kousa dogwoods and their hybrids are more resistant than flowering dogwood to dogwood anthracnose, powdery mildew, spot anthracnose, and common dogwood borers than flowering dogwood. Landscape Use: Kousa dogwood is best used as a border accent, near a deck or patio, or as a specimen. It works well at the edge of woods where it will receive some sun. Fall color will be more intense with a greater exposure to sunlight. Kousa dogwood (Cornus kousa) with spectacular fall color. Ideal soil is moist, fertile, loamy and well-drained. This tree may be more adaptable to soil conditions than flowering dogwood. It does not tolerate drought, and should be deeply irrigated during hot, dry spells. It prefers shade in the afternoon in the South, but is more afternoon sun tolerant than the flowering dogwood. Kousa dogwoods should be planted in an area large enough for good root expansion. Provide mulch under the canopy to prevent mechanical damage by mowers and weed trimmers, and to preserve soil moisture. There is a group of hybrids (C. florida x C. kousa) called the Stellar® series that incorporate some of the best qualities of each parent, and are reportedly more disease-resistant than C. florida. Other breeders have also produced extremely attractive hybrids of C. florida x C. kousa, and of C. kousa x C. nutallii (the Pacific dogwood). Mature Height/Spread: The Cornelian cherry dogwood will grow 20 to 25 feet tall and 15 to 20 feet wide. It is a rounded, multi-stemmed small tree or large shrub with a network of fine stems. Growth Rate: A slow to moderate grower, it will grow 20 feet in 25 years. For USDA zones 4 to 8. Ornamental Features: The Cornelian cherry dogwood produces showy yellow flowers in late winter and early spring, before leaves emerge. Fruit become bright red in mid-summer and are attractive to birds. Falling fruit may create litter problems and can temporarily stain walks and concrete. The fall leaf color is often poor, ranging from dull green to purplish red. Problems: This is generally a pest-free plant. It has shown good resistance to powdery mildew and dogwood anthracnose in some tests. Landscape Use: This plant can be used as a border accent, near a deck or patio or as a specimen. It can also be used in containers. It tends to be multi-stemmed, and may sucker from the lower trunk and roots, making it a good candidate for a hedge or shrub border. Lower branches may be removed to make a small tree. It will grow in a variety of soil types but prefers moist, fertile, well-drained soil. It is not tolerant of extended drought. Mulch will encourage root growth and provide moisture retention. Choose a site for the Cornelian cherry dogwood that has full sun or partial shade. The cultivar ‘Spring Glow’ may be the best selection for the South. It grows 20 feet tall and 15 feet wide and blooms in late winter with bright yellow flowers. Red edible fruit appear in July. Many excellent cultivars are available and have good disease resistance (which has limited the use of cultivars of the flowering dogwood). Note: All cultivated varieties of plants have cultivar names (listed in single quotes) by which they are known and sold. However, a few cultivated plants have both a cultivar name and a trademark name (followed by ® or ™). For these plants, the trademark name is the recognized name for consumers to use in searching for and buying the plants. For trademarked plants, the cultivar name will be either a few letters & numbers or a nonsensical name in single quotes that is completely unimportant for the consumer or landscaper. They are included here simply because they are the official assigned cultivar names. Plant breeders do this so that if someone propagates the plant without permission, they will have to call it by the cultivar name, which no one will recognize.